I was sitting on the shores of Hamilton Harbour taking pictures when a swan crept up and looked right into the lens of my camera. I did not realize it was there until I saw it suddenly staring at me in the viewfinder. I quickly refocused the camera on the swan and the same time switched to f/2.8 to decrease the DOF and clicked the picture! I got a number of shots today that I was happy with—the Nikon D300 is working out even better than I had hoped! 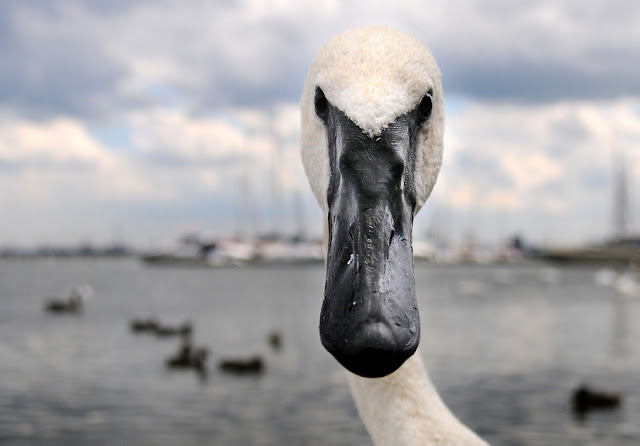 UPDATE: Someone suggested a title change from “stealthy swan” to something that mentions how the swan seems so unhappy. I took up the suggestion because for sure the swan did not seem happy at all with me taking pictures - and the glare at the camera I am sure was a protest!